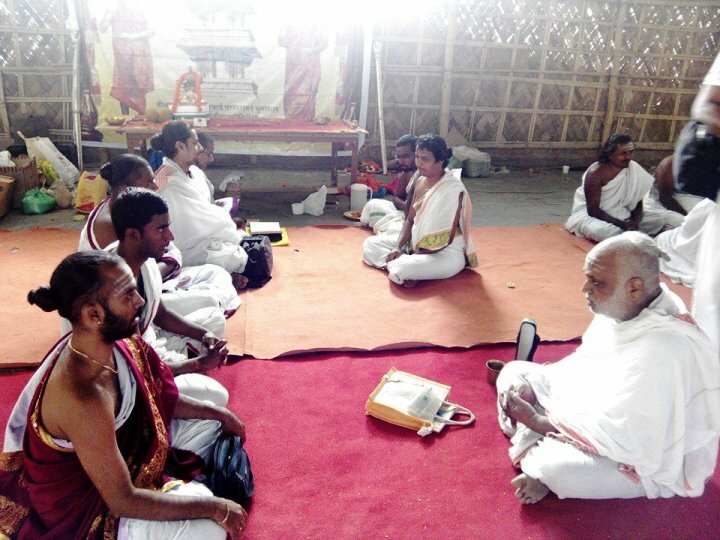 The programme commenced on 5 March 2014 with Sankalpam, followed by Go Puja. 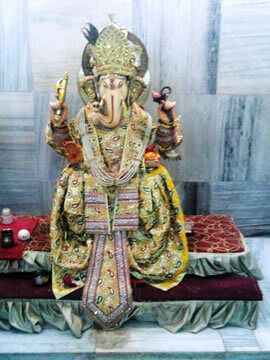 Ganapati Homam and Avahanti Japa-Homam was performed in the morning. 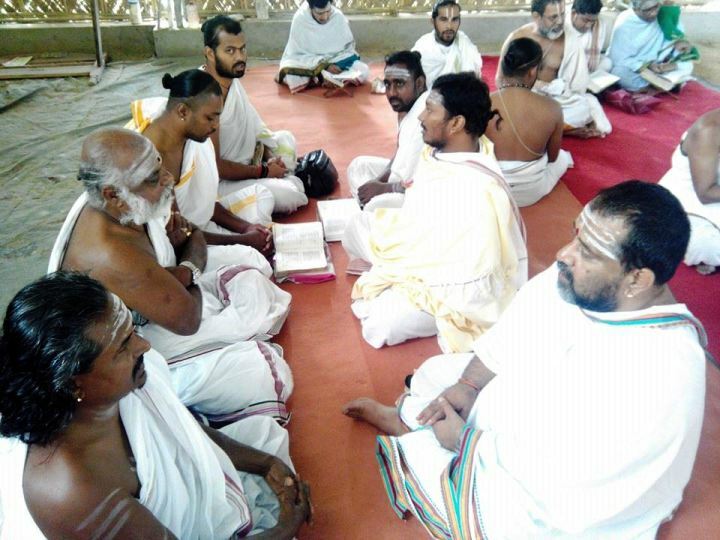 Veda Parayanam, Rudra Japam and Namasankeertanam were performed at the AoL Ashram.Scholars chanted Rigveda, Shukla Yajurveda, Krishna Yajurveda, three branches of Samaveda (Kauthuma , Jaimineeya & Ranayaneeya) & Atharvana Veda. 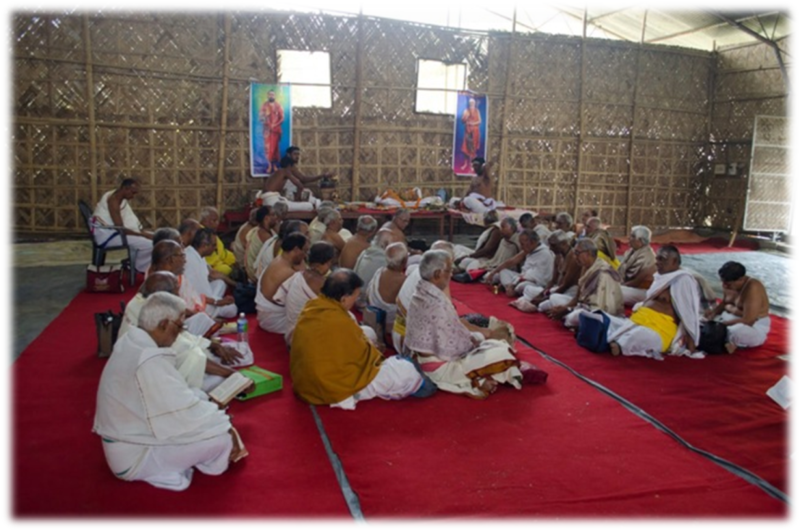 Totakashtakam, Swastivachanam, Vishnusahasranama & Sri Rudram were recited. 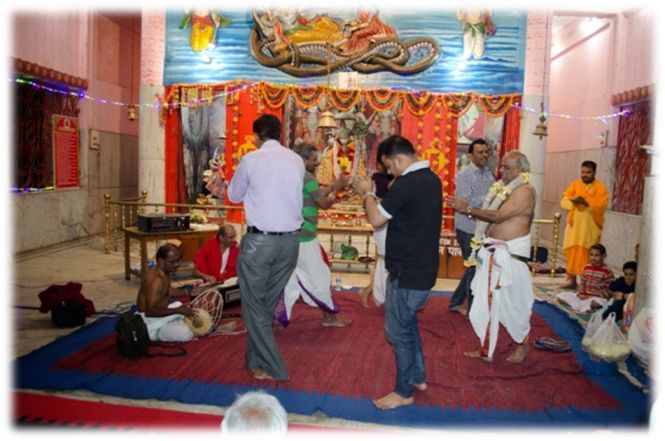 The evening programme was held in Hanuman Mandir, in the Ganga Area in Itanagar. 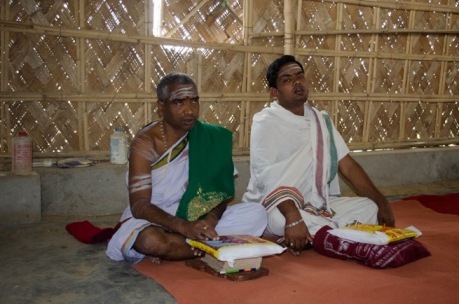 The Vaidiks performed Veda Parayanam and Rudra Japam. 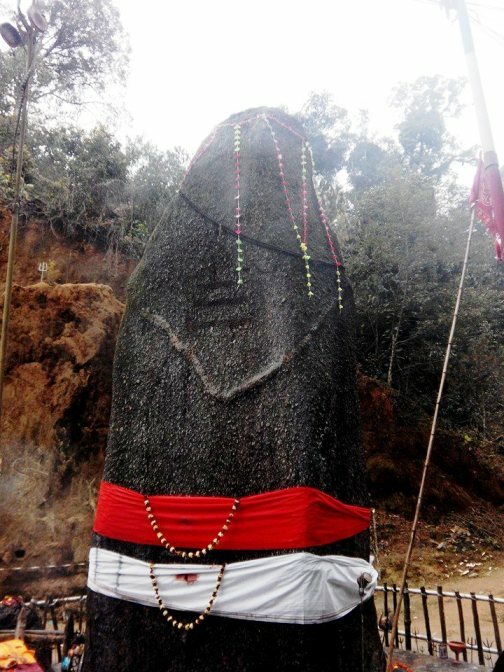 Sri V.G. 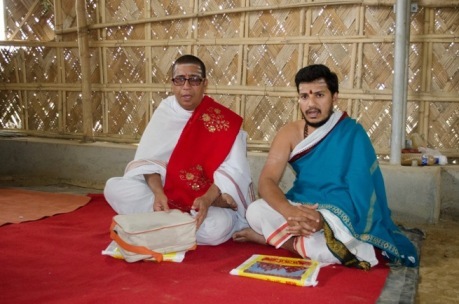 Subramanya Ghanapatigal gave a spiritual Discourse. 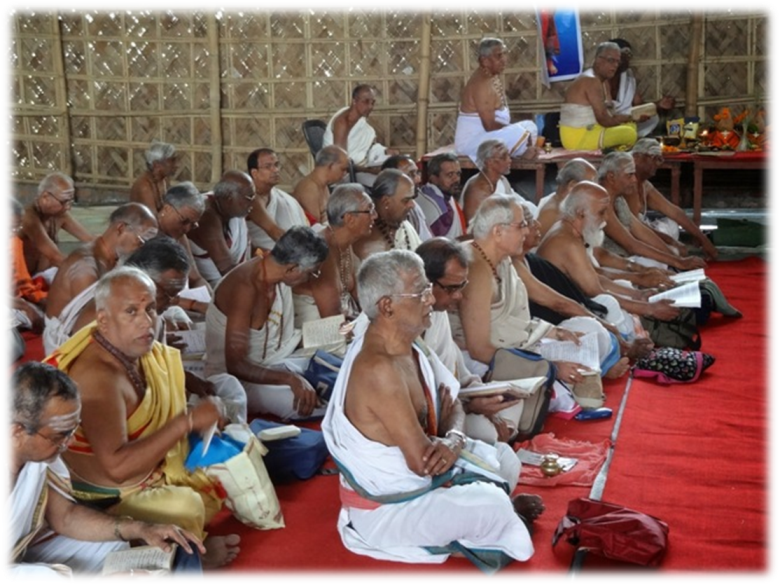 The Namasankeertana Bhagvatars led by Shri Papanasam Ramani Bhagvatar performed Seeta kalyanam and Namasankeertanam. 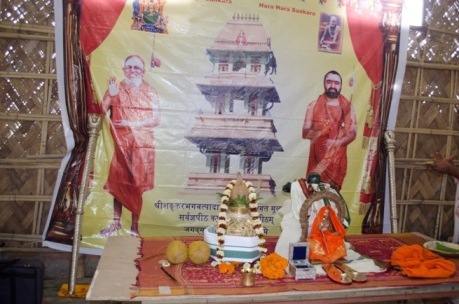 A formal inauguration of the Veda Sammelan Programme was done by Prof. Roop Kishore Shastri, Secretary of the Maharshi Sandipani Rashtriya Ved Vidya Pratishthan, Ujjain. 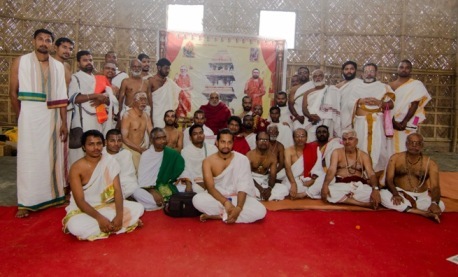 The programme concluded by around 8.30 pm. 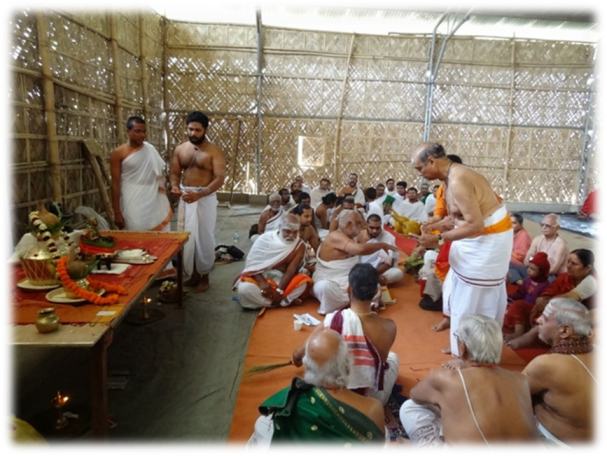 Prasaad was distributed to all the devotees. 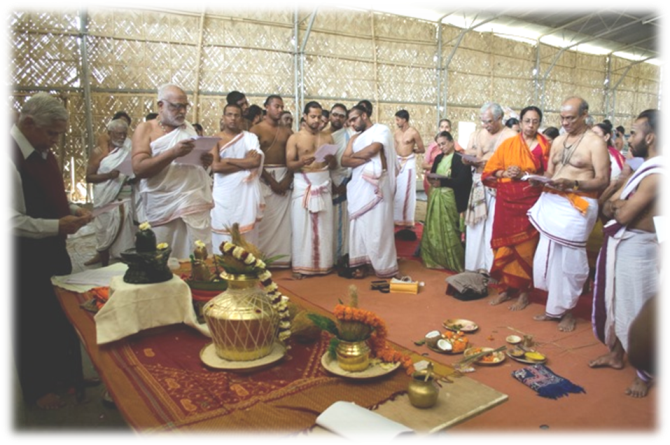 On Thursday, 6th March 2014, Sudarshana Japa Homam and Navagraha Japa Homam were done in the morning, along with Veda Parayanam and Sri Rudra Japam. 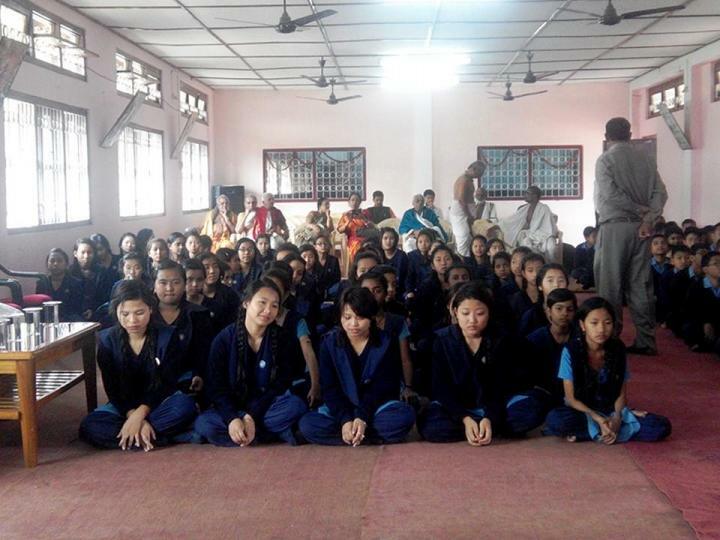 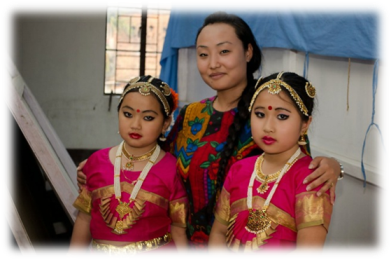 The evening session was held at Kalakshetra in Itanagar. 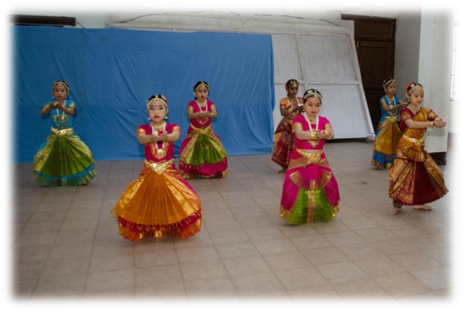 After the evening session of Veda Parayanam, a cultural programme was held in which students from the Kalakshetra gave a Bharatnatyam performance. 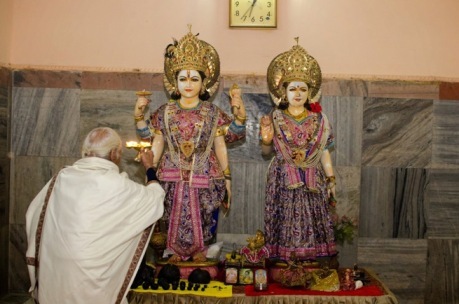 The evening programme concluded with Namasankeertanam and Radha Kalyanam. 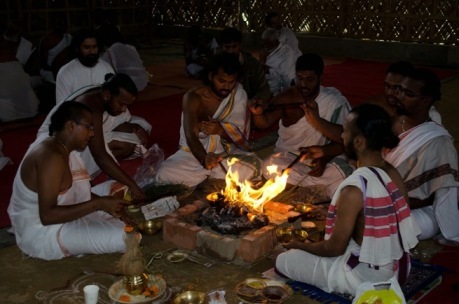 Veda parayanam in the various branches and Rudra Japam was performed in the morning, along with Rudra Homam, Durga-Lakshmi-Sarasvati Sukta Japa Homam on Friday - 7 March 2014 at the AoL Ashram. 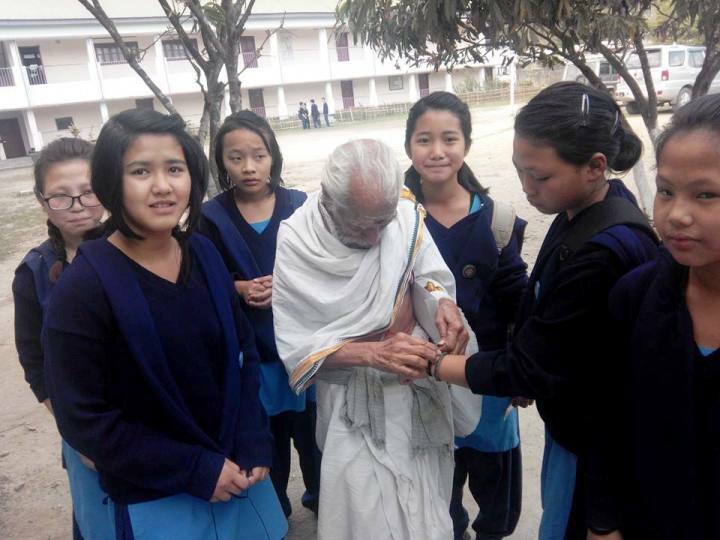 This was followed by a visit to the Vivekananda Vidyalaya at Chimpu in Itanagar. 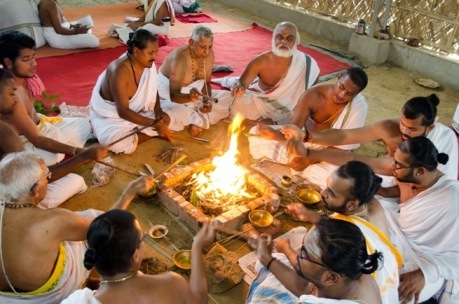 After Vedic invocation and lighting of the Kuthuvilakku, Veda Parayanam was performed. 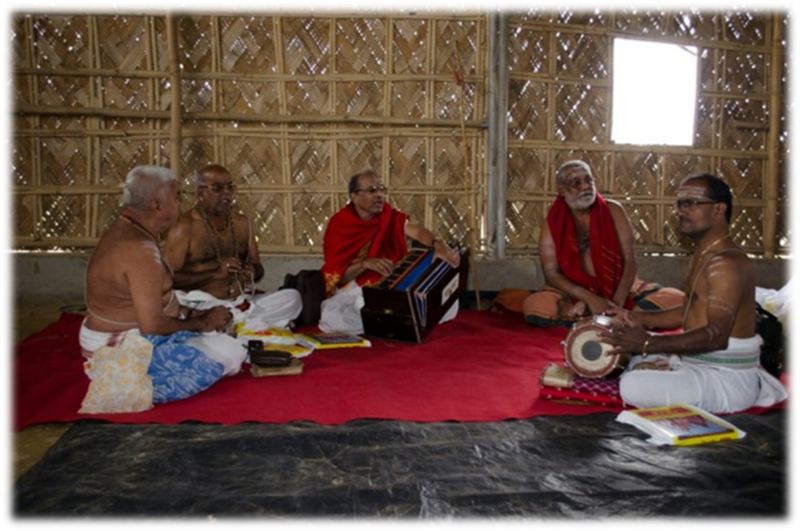 The bhajan session that followed saw active participation by the students. 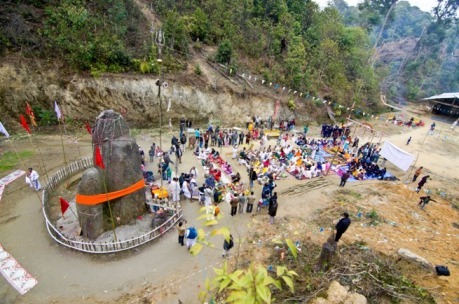 The Shiva Panchakshara Nakshatra Mala Stotra was recited. 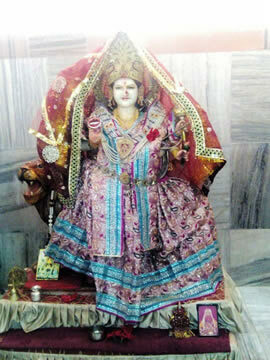 The evening programme was held at Shiv Mandir at Naharlagun. 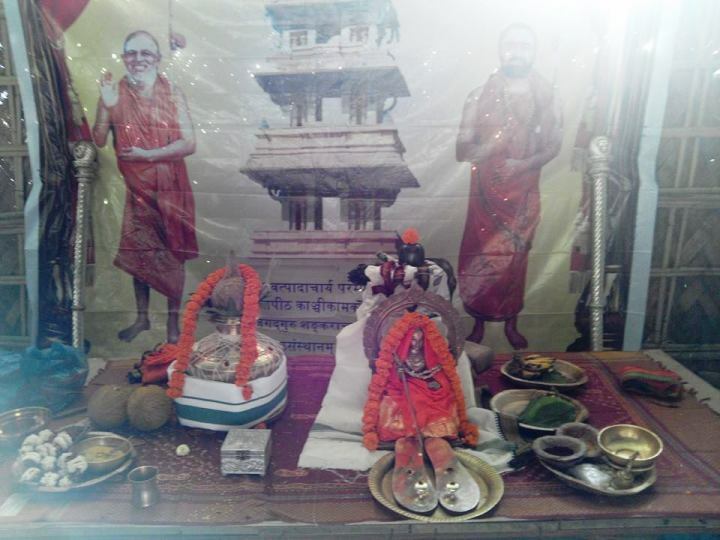 Veda parayanam and namasankeertanam was performed, followed by aarti at the Shiva Sannadhi, and other Sannadhis of Ganesha, Durga, Hanuman and Lakshmi Narayan. 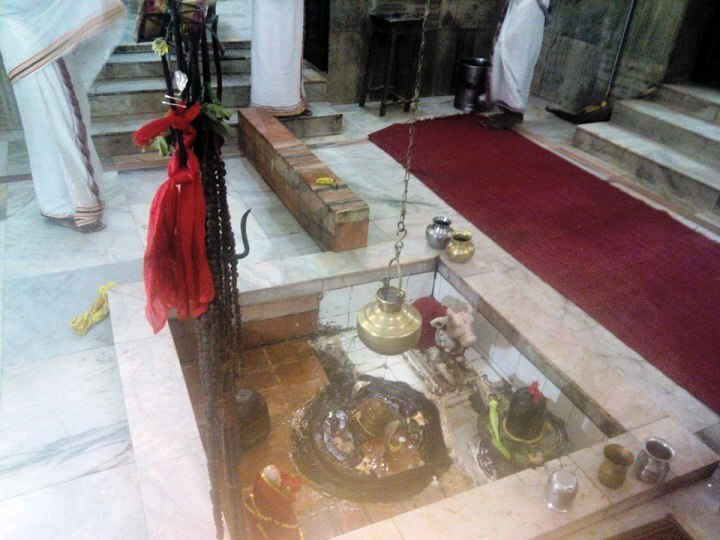 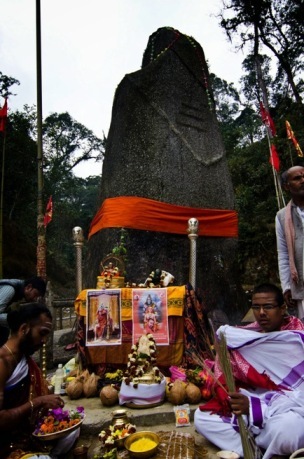 On Saturday - 8th March 2014, the team left for Ziro at about 4 a.m. and reached the the Siddeswar Nath mandir in the Kardo Forests (in teh Lower Subansiri District in Arunachal Pradesh) after a long and arduous 6 hour journey through the ghats.The Shiva Lingam at Ziro was discovered in the first fortnight of July 2004 by a wood cutter. 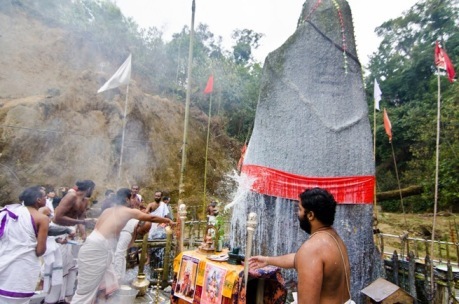 Puja was performed to the Shiva Lingam, to the chanting of Veda Parayanam, Rudra Japam and Namasankeertanam. 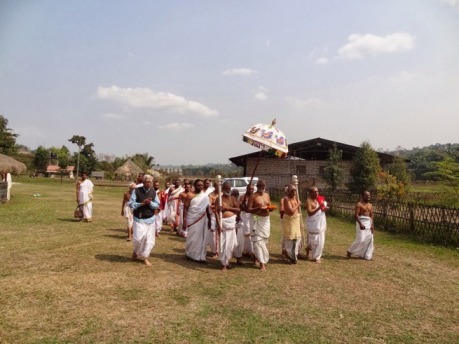 A large number of local residents participated, and received prasaad. 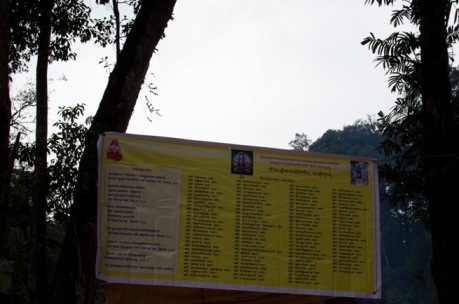 9th March - Sunday - Suryanamaskaaram was performed according to the different Veda Shakhas, and the Veda Sammelan and Viswa Shanti Yangya at Arunachal Pradesh concluded. 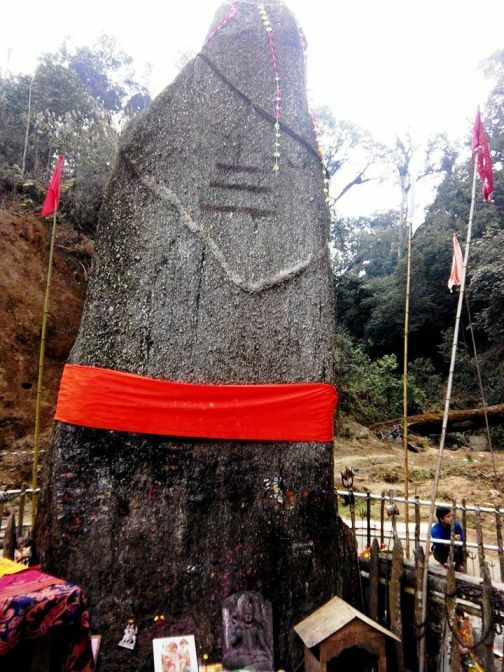 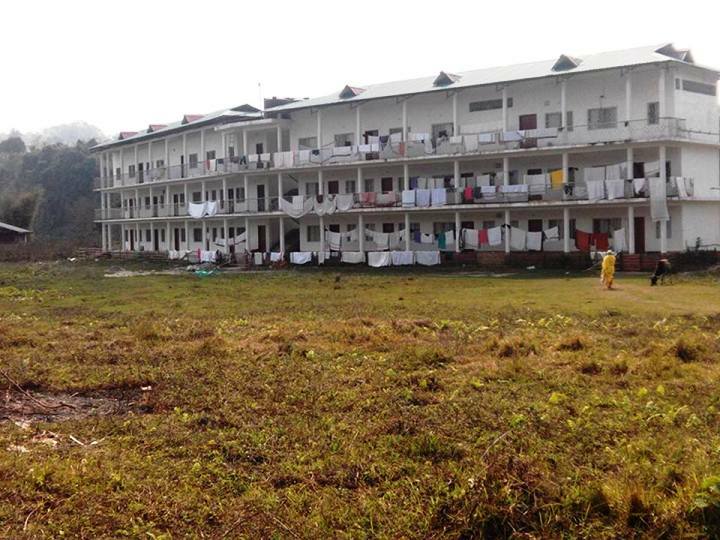 The group left from Itanagar, and reached Guwahati in the wee hours of 10 March 2014 after a 12+ hour journey by road. 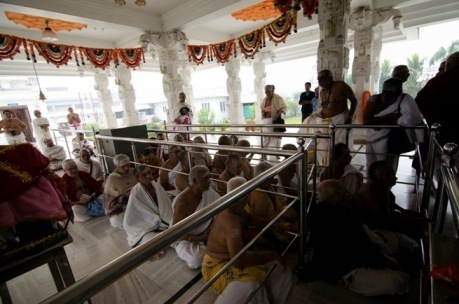 The group of participating Vedic pandits witnessed the Abhishekam performed to Balaji at the Purva Tirupati Balaji Mandir in Guwahati early in the morning, and chanted Veda Mantras. 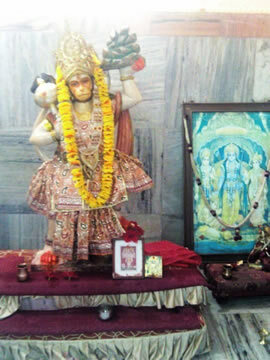 Namasankeertanam was also performed. 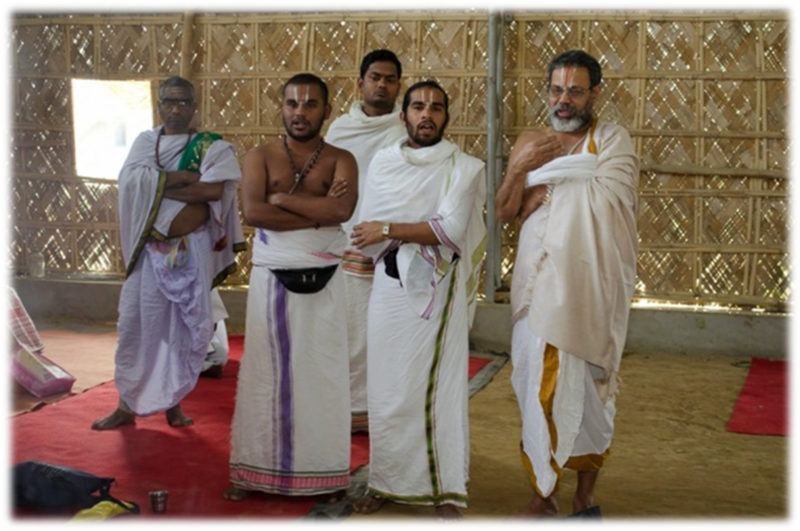 After aarti, the team visited the Sankardev Netrayala in Guwahati- a Centre of Excellence in Eye Care in the North-East, and a few other important landmarks in Guwahati. 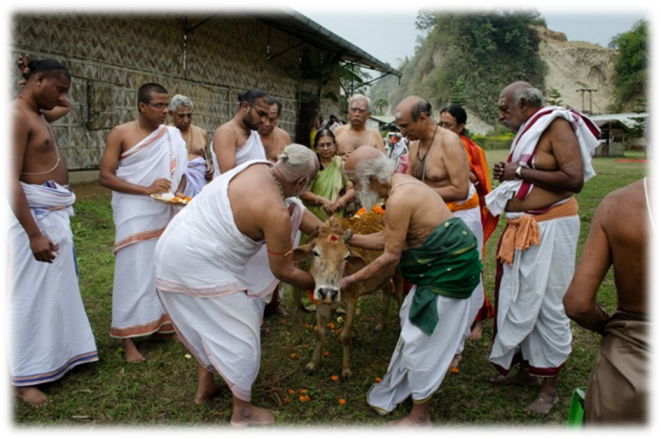 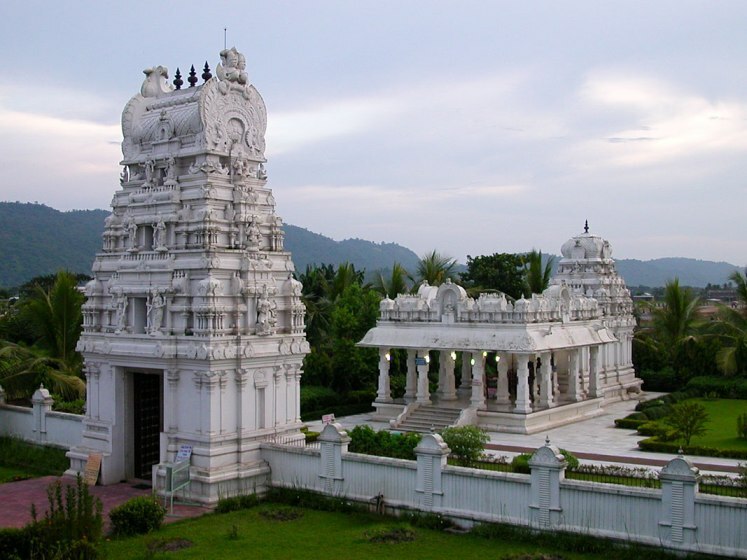 In the afternoon, the group visited the Umananda temple, located on an island in the Brahmaputra river. 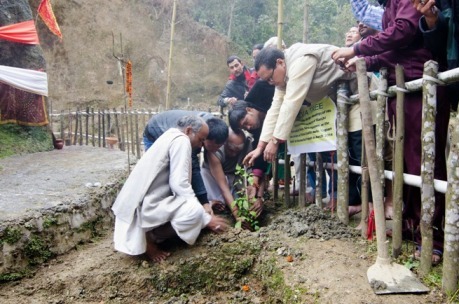 After reaching mainland, the "Brahmaputra Aarti" was performed for the first time in Guwahati(see http://kamakoti.org/kamakoti/news/2014/Brahmaputra%20Arti.html for full report). 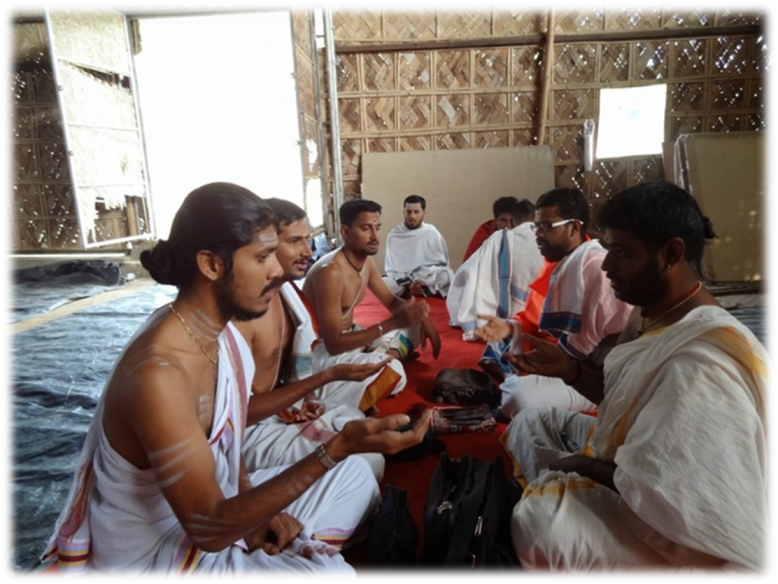 After the successful conclusion of all the spiritual and cultural programmes as scheduled, the team of Vedic scholars left for their home towns by train from Guwahati by train on the morning of the 11th March 2014, and are expected to reach back by the 13th March 2014.